At 6'8" a lot of people didn't think I handled the ball well enough to play small forward in college. 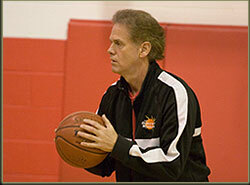 Working with Coach Guinane and some new drills, my ball handling improved and I ended up starting at small forward." 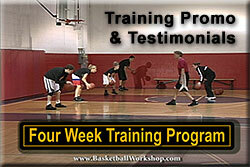 “Dave's Basketball Workshop is by far the most organized, complete instruction I've seen for players at all levels. Above all, it gets results! Players have come back to us as better individuals and team players. More importantly, their confidence level is at an all time high. Their ability to try new moves and have the confidence to use them in game situations is tremendous. I can't send enough people his way." “I have coached college basketball for 7 seasons. I am currently the head coach at Labette Community College in Parsons, KS. We have never finished lower than 4th in the conference and we have sent 7 kids to division one in my three years here. Before this, I was at Western Kentucky University where we played in two NCAA tournaments, and I had an opportunity to coach three WNBA players and several all conference performers. I can say without hesitation that Dave is one of the finest teachers of the offensive skills that are needed to take your game to the next level. He is a great teacher of how to properly shoot the basketball, but he also teaches the necessary skills to get that shot off in a game. "Don't believe the hype! Basketball is fundamentals! As a former high school All-American and University of Detroit team captain, I know the benefit of fundamentals; shooting, offensive moves and footwork. Coach Guinane provides the best methods and teaching principles to begin to master these skills. I have personally seen him work with high school and college players and the results are amazing! 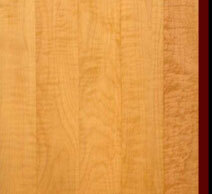 His clinics are a must for all serious players." "I would first like to thank you for working on my basketball skills with me for the past two years. I really felt an improvement within myself, (mentally and physically) after working out with you. Thank you for your time, dedication, and encouragement. You believed that I could play at a Division I level, even when I didn't believe I was good enough. Secondly, I must thank you for inviting me to come that night, at Divine Child, when Canisius was there. I basically owe my scholarship to you. That opportunity was at the perfect moment in my life and I am eternally grateful. You have helped so many people to achieve their dreams and goals. I am one of the fortunate ones to have a genuine coach help me to reach my highest goal You do more than you know for student athletes. Your caring and good nature will always be appreciated." "We would like to commend Coach Guinane on his efforts as we have seen that the instruction given our son has helped improve his fundamental skills. Our son expressed that his work with coach Guinane has helped him play with increased confidence. 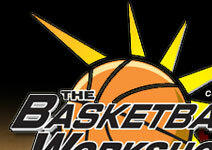 We highly recommend The Basketball Workshop to everyone." "After just four sessions with Coach Guinane, Carrie attended a major exposure camp and made the all-star team playing with an entirely different level of confidence and skill! We couldn't believe the change that took place! She was definitely a different player." "In nine months I went from the 12th man to being a starter and a captain on a Class A team that went to a regional final! Coach Guinane taught me things I've never even seen. Everyone needs to attend his clinics."